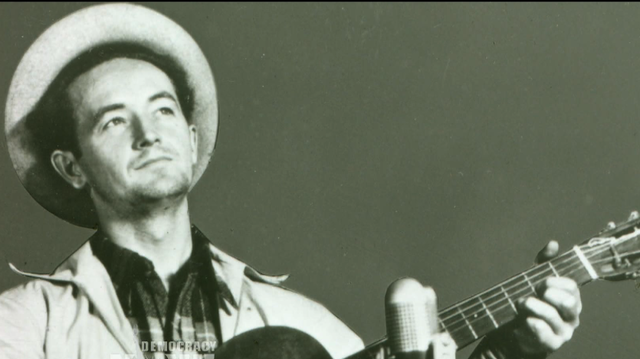 Woody Guthrie was a singer, songwriter and poet who had a major impact on American folk music. ​Woodrow Wilson Guthrie was born on July 14, 1912, in Okemah, Oklahoma. He was the second-born son of Charles and Nora Belle Guthrie. His father – a cowboy, land speculator, and local politician – taught Woody Western songs, Indian songs, and Scottish folk tunes. ​Woody’s life was full of strife growing up. He lost his older sister, Clara, to an accidental, yet tragic death which caused his mother to fall into a deep depression. 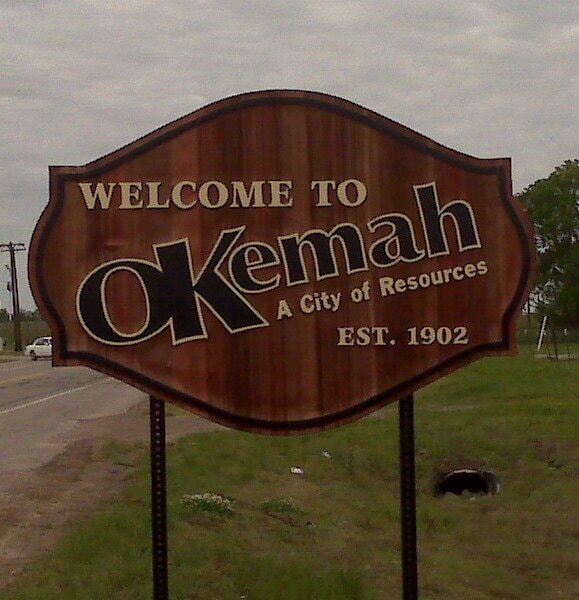 The town around him, Okemah, became a booming oil town, and withered away after the oil was gone. Many believe this to be the reason he was able to write so many songs and poems, and why he took to the open road to ramble around the country. Listening Example: "This Land is Your Land"
"This Land Is Your Land" is one of the United States' most famous folk songs. Its lyrics were written by Guthrie in 1940 based on an existing melody, a Carter Family tune called "When the World's on Fire". Guthrie’s music was always written to make a statement about the people and the world around him. 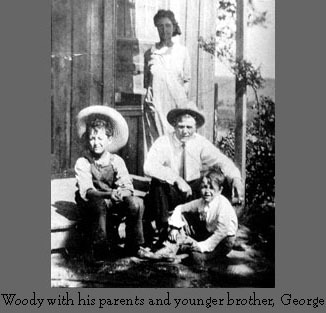 At the age of 17, Woody moved from Oklahoma, to Pampa, Texas to join his father. 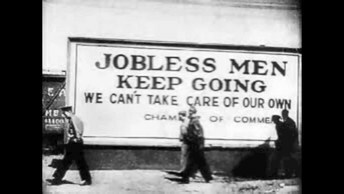 This was about the time of The Great Depression. 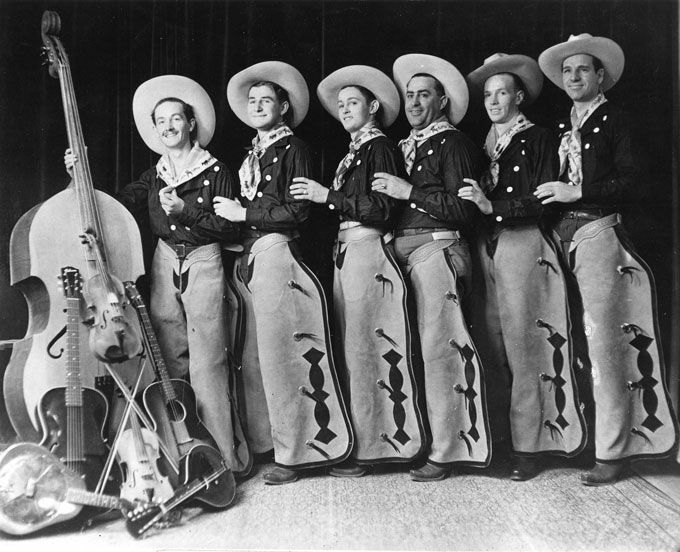 ​While in Texas, he formed a musical group called the Corn Cob Trio. 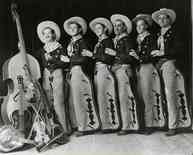 Later, they renamed the group the Pampa Junior Chamber of Commerce Band. It was during his time in Texas that Woody discovered he was a pretty good song writer, as well as artist. 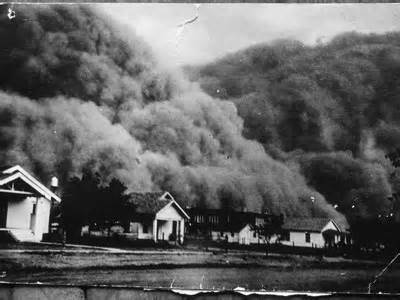 When the Great Dust Storm hit, in 1935, finding a job, or a way to feed your family, was impossible. Woody hit the road to find work. 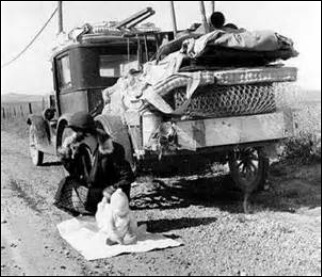 Moneyless and hungry, Woody hitchhiked, rode freight trains, and even walked his way to California, taking whatever small jobs he could. 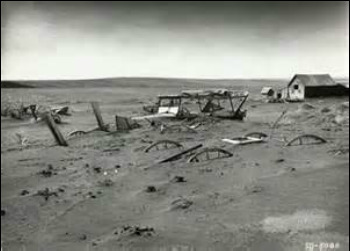 Below are some images from the The Great Dust Storm. The songs in these videos are written mostly by Woody Guthrie and sang by son, Arlo Guthrie. 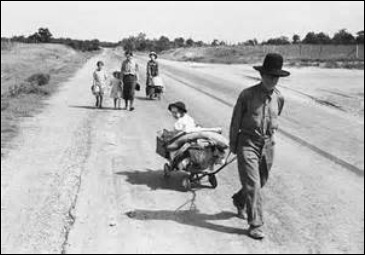 Yesterday we learned that Woody Guthrie fled Texas during the Dust Bowl to find work to help his family. That journey led Woody to California. 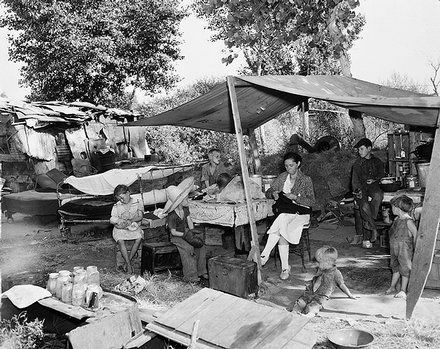 At the time, people thought that going to California would solve all their money problems. They heard there were jobs there for everyone. So, they all started to migrate, or move, to the west coast to make a better life. 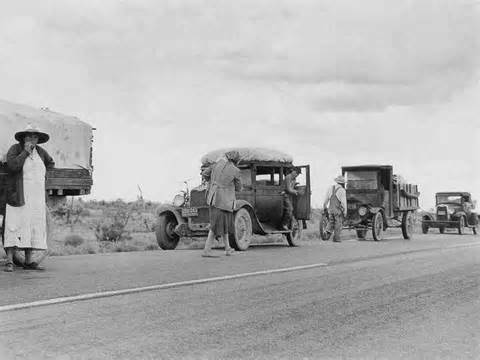 Once they got there, they found out quickly that there were no more jobs there. Too many people had gone there looking for work. Police were turning people away at the border. Woody experienced all this, and, as all great songwriters do, he turned it into a song. He felt bad for the people around him. He wanted to make sure they knew what was happening. Listening Example: "Do, Re, Mi"
“Do Re Me” was written in 1937. It is known for having two guitar parts, that were both recorded and played by Woody. However, this song also had a lot of meaning behind it. If you listen to the words carefully, you’ll realize that the Do in Do Re Mi is really talking about Dough, as in cash. He is trying to warn people that the cost of traveling to California to look for work isn’t worth it because there are already too many people there looking for work. Woody in a band as a young man. 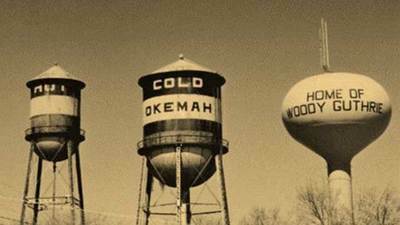 With parents in Okemah, OK.
Woody Guthrie grew up in ﻿a small town in Oklahoma﻿. He seemed to have a natural talent for music and learned to play guitar and harmonica “by ear”, rather than taking lessons. 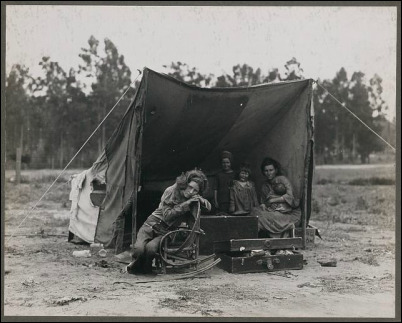 Even though Guthrie visited a lot of wonderful places in the United States, he never forgot his childhood in Oklahoma. 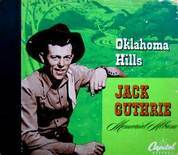 He and his cousin Jack wrote a peppy song called “Oklahoma Hills” in a style called “western-swing”. Jack recorded it in 1945. It was a number one hit, and many artists have recorded the song since then. 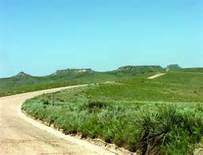 In 2001 the Oklahoma State Legislature named it their State Folk Song. Jack had a high, tenor singing voice, so the original recording might sound strange to some listeners, a little like Mickey Mouse is singing. But think about how country-western music sounded in the old days and how it sounds in today’s world. Music changes and develops through time because creative musicians are always looking for a new way to make music better. Frameworks: M.1.4., M.4.1., M.5.2., M.5.3., M.5.5. )Woody Guthrie wrote thousands of unpublished poems, articles and letters that are recorded in our National Library of Congress, along with many of his songs. During the 1940’s he wrote his autobiography, called Bound for Glory. The story is told in Guthrie’s “down-home” dialect. That means he wrote it the way he talked in everyday life. It has the flair of a true storyteller, similar to the style of Mark Twain. The book was made into a movie in 1976. Guthrie’s music contributions reached beyond his songs of American life. He influenced a new generation of young people in the early 1960’s. Groups of folk singers began to form within our country. They included Guthrie’s own son, Arlo, Bob Dylan, Pete Seeger, the group Peter, Paul and Mary, Judy Collins and others. These new songwriters addressed political issues in their music more than singers of the previous generation. This “﻿American Folk Reviva﻿﻿l﻿” focused on issues of the day, such as the ﻿civil rights movemen﻿﻿t﻿, the ﻿free speech﻿ ﻿movement﻿, and peace activists protesting the Vietnam War. Their songs brought important matters to the minds of people. 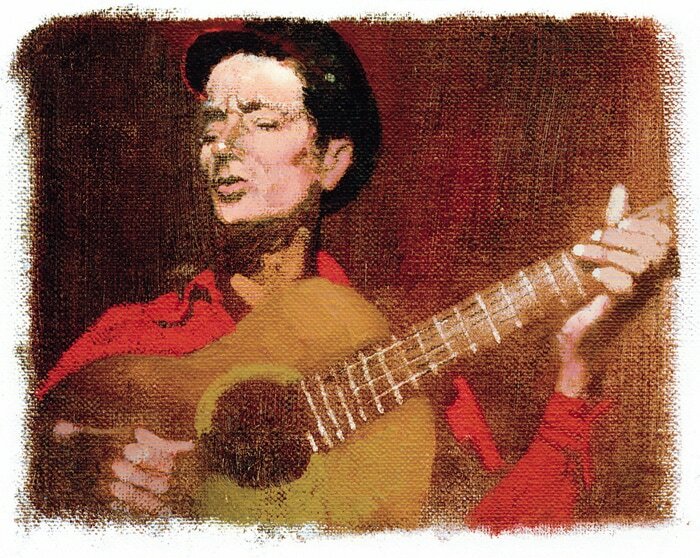 As one of the most important folk musicians in history, Woody Guthrie associated himself with “the common, everyday” people of America. Through his simple songs, he brought hope and courage to millions, told about the beauty and the development of our great nation, and encouraged others to use their creativity to help make a difference in our world.